Life is an adventure with Monica McCabe’s Jewel Intrigue Series. Adventuring is in Monica McCabe's blood. She's explored glaciers and ancient Mayan pyramids, dived shipwrecks and reef caves, camped in Sasquatch country, and drove across the USA three times. Her latest craze is collecting as many official stamps in her National Park Passport as she can. When not traveling she's writing romantic suspense novels and is currently under contract with Lyrical Press, the digital line for Kensington Publishing. Miranda Parrish is a world-renowned veterinarian specialist with expertise in endangered species. She's fearless and will go anywhere an animal is in need. But when she journeys to Katanga, an animal sanctuary in the heart of Botswana, she lands in the middle of a blood diamond smuggling operation. And there's only one man who can help her. Special agent, Matt Bennett's parents were murdered by a ruthless arms dealer when he was fourteen. He's devoted his life to avenging their deaths and ending the cycle of violence threatening southern Africa. Undercover at Katanga, he clashes with Miranda. He's never met a woman so stubborn, who'll let nothing stand in the way of what she believes in. And he'll let no one come between him and the vengeance he craves. Matt and Miranda will have to work together if they want to save Katanga, and both of their lives, before it's too late. Chloe Larson is a historian obsessed with clearing the name of her grandfather, eight generations back. After his heroic exploits during the Prussian Wars his life slid into oblivion and madness, taking with him the location of a queen’s spectacular emerald jewels. The discovery of his cryptic two-hundred-year old journal offers a clue, except it's been stolen and her only hope of recovery is proving uncooperative. Finnegan Kane is a top-notch marine bounty hunter on the hunt for the Emerald Fire, a 120-foot Sunseeker yacht seized by ruthless Caribbean pirates. It’s the kind of dirty work that keeps his antique ship restoration business afloat, but that doesn’t mean he has to put up with the fiery demands of an admittedly gorgeous historian. When Chloe offers the one thing that practically guarantees success—the GPS coordinates of the Fire’s location—he has no choice but to team up and forge into uncharted waters. With danger at every turn, Chloe and Finnegan must battle against the odds to decipher a historical legacy and settle a score against a family gone mad. Welcome, Monica! How nice to have my own niece come to visit! Proud of you! Thank you! So happy to be here! It's pretty thrilling to be a double feature...and a double author. LOL. 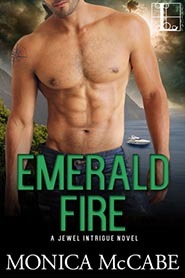 Emerald Fire is book 2 and just released yesterday. Right now I'm busy writing book 3! Taking a break today though, and so grateful for the chance to hang out with you! Hi Monica! This is a great post! Good luck on the third book and come see me when you're ready to spotlight it! I love having you on my blog! Thank you so much! I'm hard at work on #3 as its due to my editor in September. And I really enjoyed sharing time with you on your blog! Appreciate the invite! I have read Diamond Legacy and am excited to buy Emerald Fire. I wanted to ask you how long it takes for you to research the aspects of your book? Thanks for being here. Great question! Research is my favorite part of writing. Seriously. I can spend way too much time digging into stuff. Since I love to set my stories in faraway places, I haunt Google Earth a lot. I also go to sites like Trip Advisor and Virtual Tourist, and spend several wonderful hours pouring over travel details to get the inside track from folks who've been there. Same goes for my characters jobs. It needs to be interesting to me because I'm going to spend time checking it out. The heroine of Diamond Legacy is a dental zoologist. She travels to Botswana to give a root canal to a rare albino hippo. I had to research techniques, not to mention how much anesthesia it takes to sedate a hippopotamus. How fascinating is that? Can you give us a little hint about your next book in the series and if we may see Jason's own story? I just loved Jason in Diamond Legacy and heard you might have him do a cameo in Emerald Fire. Can't wait to see him again.